This epistle falls naturally into two parts. In the first one I address (what I see as) three major weaknesses of the spreadsheet theory and some underlying assumptions that make it unrealistic. In the second part I describe an alternative that I came up with trying to make the spreadsheet more physically plausible. From a temporal viewpoint, at the instant he leaves the future he arrives in the past. Therefore, at the instant Traveler leaves 2030, time ends for that history. Recognize this: when Traveler leaves 2030, he immediately arrives in 2000. When he arrives in 2000, he changes history; therefore there can be no more future from that history after 2030....That’s an important point: you can’t go back in time without changing time. A more believable scenario is that time machine initiates some kind of shock wave that spreads at the speed of light from its location annihilating the universe. But it does not quite work. In 2000 the traveler has a far larger forward light cone than he has in 2030. This cone contains everything he can possibly affect in the spacetime from that point. His activities in 2000 are able to affect distant objects before the shock wave from 2030 can annihilate their counterparts from the previous history (Fig.1). We can take this to an extreme. Suppose our traveler materializes in 2000 under the event horizon of a black hole. He is unlikely to survive for very long, but even if he does his actions can not affect anything outside the event horizon. There would be no reason for the old history on the outside to be affected at all, let alone be annihilated. Any annihilation mechanism would have to know in advance what happens to the time traveler after the jump. We know that in the A-B timeline, Traveler becomes interested in time travel, and goes back in time to create the C-D timeline; and we know that when he does so, he meets his younger self and discourages him from doing this, restoring the A-B timeline. Thus we are caught in a perpetually recurring altering time line, what we call an ”Infinity loop” or ”Bow tie loop”. There are multiple issues with this scenario. To begin with, I do not see why after 2nd, 3rd or 17th run along the C-D timeline the traveler will do exactly (or even ’mostly’) the same thing as the 1st time. As you yourself say when criticizing the fixed timeline theory, this goes against ’even the most conservative understanding of free will’. * And this is exactly a fixed timeline except it is circular rather than linear. But nevermind free will. It is also incompatible with quantum theory. There are scores of genuinely random quantum events that occur along the way from 2000 to 2030 including in the traveler’s head. They may well change his attitudes or even lead to his untimely demise. In technical terms, an infinity loop is extremely unstable against random perturbations. Such scenarios are never realized physically unless some stabilizing mechanism is in place (think of a circular pendulum staying at the highest point). My conclusion is that any infinite loop will destabilize into an infinite saw. But if the infinite loop was bad the N-jump is even worse. At least, in the loop events are allowed to oscillate between two different possibilities, in the N-jump C-D timeline must reproduce A-B in every essential way, at least as far as the time traveler is concerned. This harmony can be easily destroyed by any number of random occurences also resulting in an infinite saw. I do not see any way out of this except to advocate some version of strict determinism with only the illusion of chance. Now let us examine the infinite saw more closely. 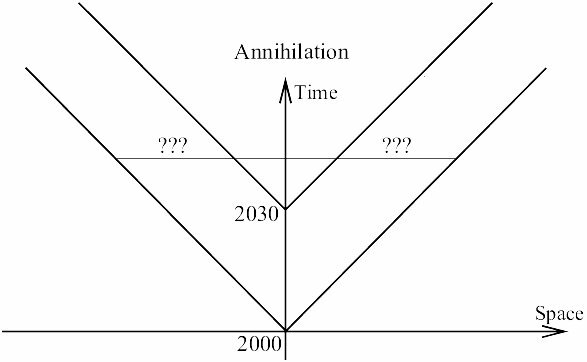 Although it is not reflected in your diagram, I assume that all of its teeth have the same past since only the future is erased each time. I also assume that there is no way to travel from a tooth to any of the previous ones since they co-exist atemporally. Therefore, a more accurate picture is that of a node with infinitely many branches sticking out of it. We end up with branching parallel worlds, where each branch oddly terminates at 30 years of age. Since there is no way to travel between them and they all share the same past it is a moot point whether they are truly parallel, or preceed each other causally, atemporally, etc. To the time traveler there is no way to distinguish between an infinite saw and parallel world travel with return to the branch he creates. As you rightly point out, this defeats the purpose of time travel. They changed in sequence, one after another; yet they did so instantly, without passage of time....Don’t fall into the error of thinking that because this particular illustration shows so much so well that it is the source of the ideas. It is a relatively late way of presenting the ideas. Perhaps the spreadsheet analogy illustrates too much too well. The reason a spreadsheet can change all the values instantly is that it is run by a central processor that has direct access to each cell. It can precalculate all the values along the sequence and then enter them simultaneously. I find this instantaneous causality that enacts changes in sequence to be the most obscure part of the theory. The only way I can imagine this working on spacetime is through a central processor of its own, an Invisible Hand, omnipresent and omnipotent, transcendent and eternal, that has direct access to its every point. In other words, God makes the changes. Implicit in the spreadsheet theory are two aphysical assumptions that pit it against the modern doctrines of relativity and quantum mechanics. As already mentioned, Sudden Death and infinite traps assume a Universal Now for the entire universe,* otherwise it is impossible to terminate old histories consistently. Instant rewrites by the Invisible Hand assume determinism (or at least predestination) to prescribe exactly what must occur in the new history and change the future accordingly. Quantum uncertainty dictates that the new history cannot be divined by any entity, even God, before it gets a chance to be created in a normal fashion, resolving quantum uncertainties in due course. Free will can be understood in this setting as a generator of macroscopic quantum uncertainties. Kant treated time as a synthetic apriori of duration, that makes our experience of events possible by sequencing them into causes and effects. Newtonian absolute time and relativistic spacetime cast time as a dimension. One can argue both ways: that ’true’ time is duration modeled mathematically as a dimension, or a dimension experienced internally as duration. Whatever the truth (if either) the fact remains that we associate any sequencing of events with a passage of time. But this observation can be turned on its head. Whether a causal sequence is temporal in the usual sense or not, we are free to add an extra dimension and place events along it to analyze them. I will introduce such a dimension to analyze time travel and call it supertime. As with the usual time, this is a mathematical trick or a deeper reality depending on one’s point of view. Imagine sitting on a bank of a wide slow river watching the water pass you by. If there is a speck in the flow you can keep track of time by observing how fast it travels. But the flow of water and the passage of time are two separate things. They are typically in synch with each other, but it can happen that the flow starts moving faster, or a boat appears moving upstream, or a bug jumps around on the water surface. I would like to compare the entire river to spacetime and its cross-sections to the universe at different instants. Then the actual time that passes as you watch the flow is akin to supertime. If you could take a snapshot of the entire river at a particular moment it will give you its state at a particular instant of your time. Similarly, it makes sense to talk about the entire spacetime stretching from the infinite past to the infinite future at a given value of supertime. But it neither stands still as in the fixed timeline theory, nor leaps from one state to another as in the spreadsheet theory. The river analogy is an allusion to the Heraclitus river: ’you cannot step twice into the same river, for other waters are constantly flowing on.’ At a larger value of supertime the spacetime may look different across its entire temporal stretch. Observers within the spacetime are normally unaware of this extra timelike dimension. Their experience is confined to a particular spacetime slice and passage of time corresponds to passage from one slice to the next, sequentially. As long as their time remains synchronized with the movement through supertime there is no point even to make this distinction. Supertime may or may not have some physical reality. But for all intents and purposes it is simply a tool to sequence changes to the timestream made by restless time travelers. One is free to interpret these sequences as purely causal and atemporal if desired. In this spirit, I will use the usual temporal terminology like instants, intervals, before and after, et cetera, in relation to supertime. Supertime is implicit in the spreadsheet theory, where the timeline from Terminator-2 ’preceeds’ the one from Terminator-3 with more timelines in between. But in the spreadsheet theory supertime is assumed to be discrete with sudden leaps, where a new present can instantly erase its old future and proceed from a blank slate. This is a temporal counterpart of ’spooky action-at-a-distance’. In contrast, in the supertime picture the spacetime goes through intermediate stages in a continuous causal sequence. When a time traveler from 2030 arrives in 2000, he does change history, but the change occurs gradually rather than coming out fully grown like Athena out of Zeus’s head. This also means that inconsistent segments of different histories may co-exist and interact within the same timestream. Let us look at the normal movement through time that we experience as living from now to now. One can visualize living as a snail crawling up the time axis as the supertime passes by. The spacetime as a whole also moves through supertime and we may synchronize the two motions. This amounts to choosing the units of supertime to coincide with the units of time in its natural flow: as we live through 1 year of time, the spacetime evolves through 1 unit of supertime. Then the speed of living, with which we normally move through time relative to supertime, is 1 under our choice of units. Now let me describe time travel with supertime. When the time traveler jumps from 2030 to 2000 at supertime 0 the old history is not erased, but flows on from 2030 sans the time traveler. 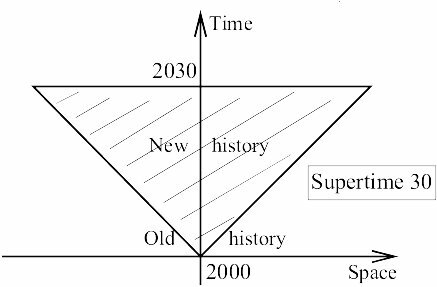 From this point on time and supertime proceed in synch rewriting the old history between 2000 and 2030 by supertime 30 (strictly speaking, the time labels refer only to the spot from which the time machine jumped in 2030). Spatially, the rewrite wave spreads along the light cone from the point in spacetime at which the time machine reappeared in 2000 (Fig.2). Temporally, it propagates at the speed of living. At the wavefront old and new histories come into contact with the old one being rewritten into the new. Thus, at the boundary of the light cone we have causally inconsistent fragments coexisting within the same spacetime, i.e. the spacetime at a given supertime value. So, what happens at the wavefront of rewrite? Contra stories like The End of Eternity, there are no explosions, tremors, crashes or anything else dramatic. To observers within the timestream the rewrite wave is not detectable at all. Indeed, the wave rewrites the entire old history into a coherent new one, including the internal observers’ memories, so everything will appear as if no change ever occured at all. More precisely, there are no internal observers that exist both before and after the rewrite. Old observers cease to exist without feeling a thing. The replacements come with no knowledge of the old history and a consistent set of new memories--to them their present is exactly what it should be. To detect the rewrite waves an observer must be able to insulate herself from the effects of the time flow, say by creating a time bubble that shields her from being rewritten. Like a speck in the flow she will float with time without being affected by it. On top of that, she should be able to move slower than the flow, or faster, or in particular stay at the same supertime value like a boat anchored to the bank of the river. Otherwise, the rewrite wave will stay either ahead or behind her, and nothing special will happen. Assuming this is possible, to such an observer the events will unfold as depicted e.g. in Back to the Future. She will see a ’magic’ shift in scenery: objects suddenly changing contours, some popping into existence, others popping out of it. Bubbled observers are the only ones seeing others fade or disappear. It is clear that with supertime the timestream does not suffer from Sudden Death. Therefore, time can never get trapped in any finite interval. When the traveler goes to 2000 the old history minus him proceeds unphased at the speed of living. If he convinces his younger self to repeat the trip in 30 years, the new rewrite wave will start spreading from 2000 and so on. As a result, the timestream will be segmented into causally coherent 30-year long segments propagating forward in time at the speed of living and separated by rewrite wavefronts (Fig.3). This is the supertime version of the infinite saw. Infinite loops will never occur because of instability, but segmented timestreams with odd and even segments (devolved to matching time levels) closely resembling each other would make a close approximation. Thus, what infinite ’traps’ actually do is create highly inconsistent but still infinite timestreams. Similarly, N-jumps create timestreams with a single wavefront since the time jump never recurs. All of this assumes of course that no other travelers emerge. Otherwise, our traveler may face a surprise in 2000 by finding it nothing like what he remembers. Indeed, someone else may have altered this segment already, at earlier supertimes. As the changes propagate at the speed of living they will never catch up with any future evolved from preceeding versions of 2000. Time travel is the only way to verify that the timestream is not causally consistent. Moving into the future has no effect on time or history, unless it is accompanied by a trip into the past. Going three years into the future is no different than moving to Boston for three years, except that you aren’t any older....As far as anyone else is concerned, as far as history is concerned, as far as time itself is concerned, you went away for a while, and then you came back. Not so anymore. If a traveler jumps into the future he will not encounter the future derived from his own present. Instead, he will find the future evolved from an earlier (in supertime) version of his present. It may be similar, especially if no other jumps occured in between, but quantum uncertainties inevitably make it different. The traveler’s future does not yet exist at the supertime of the jump and therefore can not be visited. Skipping time is not at all like hybernating in Boston for three years. To summarize, supertime turns spacetime into a dynamic object. Each spacelike slice does not stay frozen once a single active present flows past it, ’for other waters are constantly flowing on.’ Each slice of spacetime is an active present in its own right. As such, it resolves quantum uncertainties differently and shifts from being its future’s exact past. In other words, the spacetime changes at every spatial cross-section as it moves through supertime, but cross-sections with the same temporal height are not causally related. Instead, they are caused by cross-sections at earlier supertimes with smaller heights. If we accept time travel I do not see how to avoid this dynamism without making rather unnatural assumptions. Spreadsheet theory assumes (I think) that the past stays frozen until being reactivated after a time jump. It is not clear what to think about the future. If it is already ’there’ we have a grand illusion of living, while simply retracing predestined events. Then time travelers, and they only, would have a singular ability to break this chain of predestinations. If the future is not yet ’there’ then one can only travel to the past and never return. Indeed, time jump into the past presumably moves the active present there with nothing existing beyond it. Of course, we may have a situation of a dynamic equilibrium, where quantum foaming leaves events largely unchanged at the macroscopic level. Typically, one does not see big changes in a river despite new waters flowing on. If no time jumps happen it is reasonable to expect such behavior, at least over relatively small intervals of supertime. While the past our traveler encounters is technically not his own, it may not be distinguishable from his own for all practical purposes. In such cases one can expect to see causally consistent spacetimes at each value of supertime. An interesting point is that (exotic) dynamic equilibria exist even with time jumps. They correspond to self-consistent histories with uncaused causes: billiard balls jumping from the future to knock themselves into a mouth of a time machine to go back to that future. These are the subjects of the fixed timeline theory. It is tempting to speculate that timestream may have some kind of dissipation mechanism that would drive any given timestream towards a dynamic equilibrium. After all, ripples from a rock thrown into a river eventually dissipate. However, such a mechanism seems rather fantastic: spacetime itself must somehow resist the time traveler’s attempts to rewrite it. This sounds a lot like Devious Nature in fixed timeline theory that you convincingly criticize. Millions of capable individuals are going to have their specific intended actions thwarted by her efforts, and it will be done so subtly there will be no hint it was anything other than happenstance. A gun misfired. A bomb did not go off. You killed the wrong person. The police caught you first. Nature is a very clever lady, if she can do all that. On the other hand, even a normal rewrite wave is quite a feat. A dissipation mechanism would have to interpolate between the history that is already in place (like a planet in one piece) and a history that the time traveler is trying to create (like the planet blown into smithereens). It is hard to say what shape such interpolation might take or, more importantly, how it can be enacted physically. Regardless of answers to such questions, to a time traveler within the time flow such temporal resistance will manifest itself as just a particularly insidious string of bad luck. It may be overcomable, but would require a large expenditure of energy. On a positive side, temporal resistance can lead to cohering a timestream segmented by multiple rewrites, into a normal or exotic equilibrium. It is curious to ponder what kind of equilibrium would result say from rewrites in the Terminator series. I do not see why the time traveler should play such a singular role, especially concerning events that he cannot possibly influence even from 2000. Effectively, the spreadsheet theory sweeps the dirt under the rug. It makes more sense that the old history is not affected by the time jump at all until the changes enacted since 2000 get a chance to propagate normally through spacetime. To some degree the supertime picture incorporates elements of both the spreadsheet theory and the branching multiverse. Just as in the latter, alternative histories get a chance to develop. But in contrast, only segments of their chronologies survive and they all share the same spacetime. Moreover, time travel enables interaction between different segments. Also, while in the multiverse every quantum event creates a new branching timeline, the supertime picture is more conservative. For any normal event the wave function really collapses into a single state cutting off all alternative branches. Only time jumps can initiate a new history and only at the expense of rewriting parts of the old one. No two events sharing the same spacetime coordinates can co-exist.